Background: Even after more than three decades of implementation, the success of Integrated Child Development Services program in tackling maternal and childhood problems still remains a matter of concern. The present study was conducted to evaluate nutritional and other activities at Anganwadi centers (AWCs) in different districts of Gujarat state, India. Materials and Methods: A total of 60 AWCs were selected including 46 AWCs from the rural area and 14 AWCs from the urban area during April 2012 to March 2013 from 12 districts of Gujarat. Five AWCs were selected from one district randomly. Detailed information about various nutritional activities including growth monitoring, information related to preschool education (PSE), and nutrition and health education (NHED) were collected. Results: Growth chart was present in 96.7% AWCs and accurately plotted by Anganwadi workers (AWWs) in 95.0% AWCs. Weight monitoring of children was done by using Salter scale/spring balance in 75.0% AWCs, followed by weighing pan (18.3%). Overall 18.5% moderately malnourished and 1.5% severely malnourished children were reported. PSE material was available only in 35.0% AWCs. Only in one-third AWCs, NHED training material was available in adequate quantity. Conclusion: There were gaps in the status of PSE activities in AWCs, which needs to be promptly addressed. The need for PSE should be emphasized to all AWWs. There was also a shortage of supply of PSE and NHED material at the AWCs suggesting need of regular supply of material. The program is executed through dedicated cadre of female workers named Anganwadi workers (AWWs), who are chosen from the local community and given 4 months training in health, nutrition, and child-care. She is in charge of an AWCs and is supervised by a supervisor called Mukhya Sevika. AWW is also assisted by helper who works with AWW and helps in executing routine activities at AWCs. Several studies reported association of improved nutritional status and immunization status of <3 years age, with ICDS services ,, and others reported no such association. , Even after more than three decades of implementation, the success of ICDS program in tackling maternal and childhood problems still remains a matter of concern. According to National Family Health Survey 3, countrywide though 81.1% children under age 6 years were covered by AWCs, children who received any service from AWC were only 28.4%. The need for revitalization of ICDS has already been recommended toward better maternal and child health especially in rural areas. The present study was conducted to evaluate nutritional and other activities at AWCs in different districts of Gujarat state, India. Various tasks relating to supervision and monitoring of the scheme are being undertaken at state level with the help of selected academic institutions like community medicine department of the medical college, home science colleges. From Gujarat state with 25 districts, two institutions namely Community Medicine Department, P D U Government Medical College, Rajkot and Community Medicine Department, Government Medical College, Vadodara were approved by NIPCCD. The present study was conducted by Community Medicine Department, P D U Government Medical College, Rajkot in 12 districts of Gujarat as directed by NIPCCD. The 12 districts were included namely Ahmedabad, Amreli, Bhavnagar, Gandhinagar, Jamnagar, Junagadh, Kutch, Mehsana, Patan, Porbandar, Rajkot, and Surendranagar. As per the guidelines provided by NIPCCD, from selected 12 districts, three districts are to be visited in one-quarter and so one district per month. From selected district, randomly one ICDS block was selected first. In the next stage, from each selected block, five AWCs were selected randomly. Hence, a total of 60 AWCs were selected including 46 AWCs from the rural area and 14 AWCs from the urban area during April 2012 to March 2013. An attempt was made to select not >2 AWCs from each of the supervisory circle. A team of four members from Community Medicine Department, P D U Government Medical College, Rajkot visited the selected AWCs. The growth chart was available in 96.7% AWCs [Table 1]. The accurate plotting of height and weight was demonstrated by 95.0% AWWs. Salter scale/spring balance was used mainly (75.0%) by the AWWs to record weight of children. 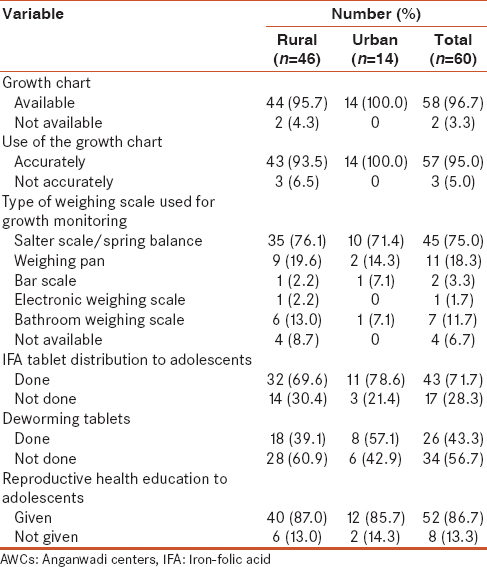 Distribution of iron-folic acid (IFA) tablets to adolescent girls was done in 71.7% AWCs. Reproductive health education to adolescent girls was given in 86.7% AWCs. Nutritional grades of registered children were assessed from visited AWCs according to WHO growth chart. The malnutrition was reported among 20.0% children including 18.5% children with moderate and 1.5% with severe malnutrition [Table 2]. All registered children were getting PSE in only 20% AWCs [Table 3]. PSE was given as per the timetable in 60% AWCs [Table 4]. The AWCs were using timetable either as prescribed by the state government (21.7%) or as based on a weekly theme (21.7%). 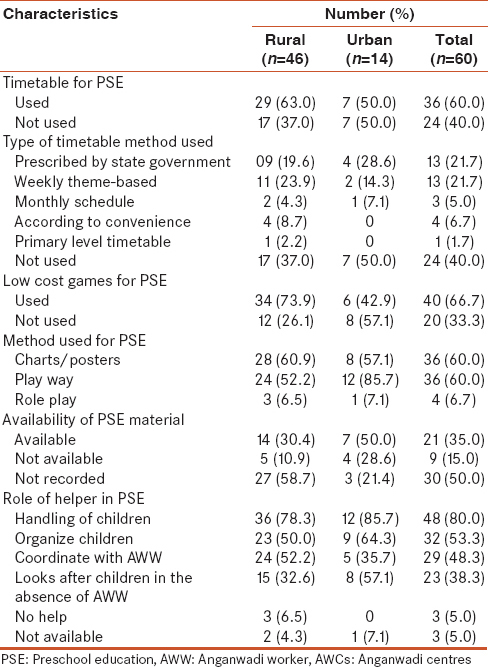 Use of low-cost games (66.7%), charts/posters (60.0%), and the play way (60.0%) were mainly used for PSE. Only 35.0% AWCs had availability of material used for PSE. Helpers were assisting to AWWs for PSE in handling of children (80.0%), organizing PSE (53.3%) and coordinating with AWWs (48.3%), looks after children in the absence of AWW (38.3%). 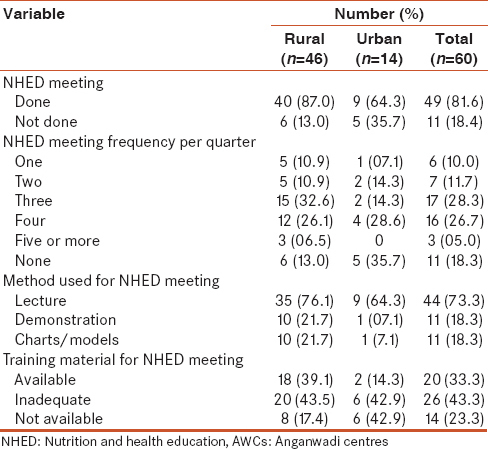 Nutrition and health education meeting was done more in rural areas (87.0%) than in urban (64.3%) as shown in [Table 5]. 1-5 or >5 NHED meetings were conducted per quarter in 81.6% AWCs. Mainly lectures (73.3%) were used for NHED meeting, followed by use of demonstrations (18.3%) and charts/models (18.3%). In one-third AWCs, training material was available in adequate quantity, but in 23.3% AWCs NHED material was not available. As a key indicator of progress toward the Millennium Development Goal (MDG) of eradicating extreme poverty and hunger, the global community has designated halving the prevalence of underweight children by 2015. However, it appears that economic growth alone, though impressive, will not reduce malnutrition sufficiently to meet the MDG nutrition target. Health of women, adolescent girls, and children is of prime importance. Success of growth monitoring depended upon the extent to which counseling support, weighing scales, growth charts, etc., were available in AWCs. Availability (96.7%) and accurate use of the growth chart (95.0%) to assess the nutritional status of children were reported, similar to Puducherry (95%),  but reported low in other studies among the AWWs (25-59%). ,, For recording weight of children, mainly use of Salter scale (75.0%) or weighing pan (18.3%) was reported in the present study. Studies have reported that AWWs were not conversant with the plotting of growth curves even after receiving necessary training. , Growth curves provide the earliest indication of growth failure, hence, AWWs must be adequately trained to plot growth curves, and they can specifically be monitored on this by the supervisors and the Child Development Project Officers of the project areas. Distribution of IFA tablets to the beneficiaries was done in 71.7% AWCs which was high compare to previous studies (10-35%). ,, Deworming tablets were distributed in (43.3%) AWCs and recorded in the present study, which was not even recorded in Puducherry. Reproductive health education to adolescent girls was given in 86.7% AWCs. This study reported 18.5% moderately malnourished and 1.5% severely malnourished children, which was lower than reported in other areas. ,, The record keeping by AWWs was inadequate related to the nutritional aspect of children in the present study and can be improved by sensitizing them about the importance of same and also by providing good quality training. There were gaps in the status of PSE activities in AWCs, which need to be promptly addressed. The need for PSE should be emphasized to all AWWs. It is recommended that regular workshops for ICDS staff to improve and strengthen the knowledge and practices on PSE should be conducted. There was also a shortage of supply of PSE and NHED material at the AWCs suggesting need of regular supply of material. Three decades of ICDS - An Appraisal. National Institute of Public Cooperation and Child Development (NIPCCD), 2006. Available from: http://www.nipccd.nic.in/reports/icdsvol3.pdf. [Last accessed on 2013 Jul 12]. Integrated Child Development Services (ICDS) Scheme. New Delhi: Ministry of Women and Child Development, Government of India. Available from: http://www.cd.nic.in/icds.htm. [Last accessed on 2013 Aug 09]. National consultation to review the existing guidelines in ICDS scheme in the field of health and nutrition. Indian Pediatr 2001;38:721-31. Patil SB, Doibale MK. Study of profile, knowledge and problems of Anganwadi workers in ICDS blocks: A cross sectional study. Online J Health Allied Sci 2013;12:1. Available from: http://www.ojhas.org/issue46/2013-2-1.html. [Last accessed on 2013 Aug 24]. Kapil U, Pradhan R. Integrated Child Development Services scheme (ICDS) and its impact on nutritional status of children in India and recent initiatives. Indian J Public Health 1999;43:21-5. Saiyed F, Seshadri S. Impact of the integrated package of nutrition and health services. Indian J Pediatr 2000;67:322-8. Bhasin SK, Bhatia V, Kumar P, Aggarwal OP. Long-term nutritional effects of ICDS. Indian J Pediatr 2001;68:211-6. Agarwal KN, Agarwal DK, Agarwal A, Rai S, Prasad R, Agarwal S, et al. Impact of the integrated child development services (ICDS) on maternal nutrition and birth weight in rural Varanasi. Indian Pediatr 2000;37:1321-7. Trivedi S, Chhaparwal BC, Thora S. Utilization of ICDS scheme in children one to six years of age in a rural block of central India. Indian Pediatr 1995;32:47-50. Gragmolati M, Bredenkamp C, Dasgupta M, Lee YK, Shekar M. ICDS and persistent undernutrition: Strategies to enhance the impact. Econ Polit Wkly 2006;1193-201. Available from: http://www.bpni.org/Article/ICDS_and_persistent_undernutrition.pdf. [Last accessed on 2013 Aug 29]. National Family Health Survey, India 2005-06. (NFHS 3) Mumbai: International Institute for Population Science and Macro International; 2007. Tandon M, Kapil U. Integrated child development services scheme: Need for reappraisal. Indian Pediatr 1998;35:257-60. Gurukartick J, Ghorpade AG, Thamizharasi A, Dongre AR. Status of growth monitoring in Anganwadi centres of a primary health centre, Thirubhuvanai, Puducherry. Online J Health Allied Sci 2013;12:2. Available from: http://www.ojhas.org/issue46/2013-2-2.html. [Last accessed on 2013 Sep 24]. Centers for Disease Control and Prevention. Epi info version 3.5.1, 2008. Available from: http://www.cdc.gov/epiinfo/. [Last accessed on 2011 Aug 21]. Manhas S, Dogra M. Awareness among Anganwadi workers and the prospect of child health and nutrition: A study in Integrated Child Development Services (ICDS) Jammu, Jammu and Kashmir, India. Anthropology 2012;14:171-5. Gopalan C. Growth charts in primary child-health care: Time for reassessment. Indian J Matern Child Health 1992;3:98-103. Kapil U, Saxena N, Nayar D, Gnanasekaran N. Status of growth monitoring activities in selected ICDS projects of Rajasthan. Indian Pediatr 1996;33:949-52. Dixit S, Sakalle S, Patel GS, Taneja G, Chourasiya S. Evaluation of functioning of ICDS project areas under Indore and Ujjain divisions of the state of Madhya Pradesh. Online J Health Allied Sci 2010;9:2. Available from: http://www.ojhas.org/issue33/2010-1-2.htm. [Last accessed on 2013 Aug 12]. Benjamin AI, Panda P, Zachariah P. Maternal and child health services in Delhon block of Ludhiana district: Result of ICDS evaluation survey. Health Popul Perspect Issues 1994;17:69-85. Surwade JB, Mantri SB, Wadagale AV. Utilization of ICDS scheme in urban and rural area of Latur district with special reference to pediatric beneficiaries. Int J Recent Trends Sci Technol 2013;5:107-10. Thakur JS, Prinja S, Bhatia SS. 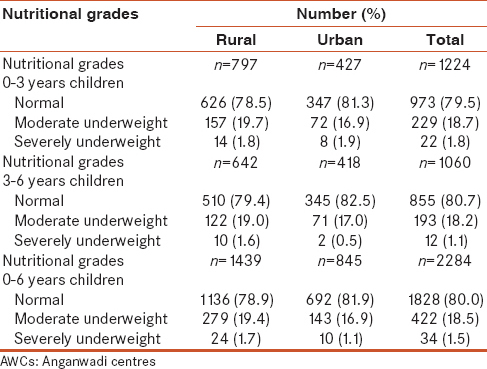 Persisting malnutrition in Chandigarh: Decadal underweight trends and impact of ICDS program. Indian Pediatr 2011;48:315-8. Avachat SS, Phalke VD, Phalke DB. Epidemiological study of malnutrition (under nutrition) among under five children in a section of rural area. Pravara Med Rev 2009;4:20-2. Panday V. Community participation towards Anganwadi services in Kakori block of Lucknow district. Indian J Matern Child Health 2011;12:1-5. Thajnisa M, Nair MK, George B, Shyamalan K, Rema Devi S, Ishitha R. Growth and development status of Anganwadi and private nursery school children - A comparison. Teens 2007;1:23-4. Nair MK, Mehta V. Life cycle approach to child development. Indian Pediatr 2009;46 Suppl: s7-11. Ghosh S. Second thoughts on growth monitoring. Indian Pediatr 1993;30:449-53.